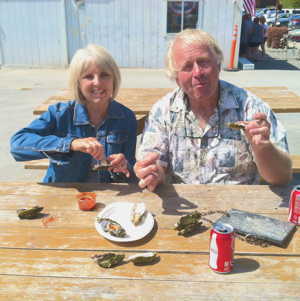 Russ Imrie July 2012 – disclaimer: I know the owners of and am in favor of continuing the operation of Drakes Bay Oyster Company in Point Reyes National Seashore and believe the National Park Service’s (NPS) vendetta [on the oyster operation] is misguided and an abuse of power. This is an OPINION piece. Many others have weighed in on this issue which has touched on Washington DC, (Congress and is even, in some fevered minds, Obama’s fault) and Sacramento but which actually involves every American. For absolutely the best collection of documents, letters, news on this PLEASE go to the Oysterzone, a blog created by Jane G. of Point Reyes Station. This tiny sustainable operation has so much going for it above and beyond its position as a local “poster child” for malignant regulation abuse. Thirty skilled aquaculture workers are tasked with moving raw shellfish to the crowded counter a few feet away in a wholly transparent operation that adds to park visitors’ experience and pleasure. The oysters are raised in a very natural manner that does not disturb wildlife more than many human activities and the oysters filter water in the estuary. This is a natural function that (according to a July 6, 2012 article in the San Francisco Chronicle) all-but-extinct native oysters performed before they were lethally harvested and polluted out of the picture along the California Coast. The farm harvests 40% of the total California oyster totals and its fees to the beleaguered state budget (about $15,000 per year) support much of the states’s aquaculture budget. This is to say nothing about payroll taxes from the aforementioned employees. That’s not a lot but what are they thinking? Can California afford throwing away a single dollar and adding to unemployment? Is the NPS in charge of California’s state budget? Are partisan politics and policy blinding the NPS from the fact that local business and workers pay a lot of tax in this country, on this planet? The nonsense goes on…the NPS at Point Reyes is celebrating it’s 40th year. They have a “green” electrically-powered Toyota RAV EV all painted at the park headquarters. But, but…Importing the tons of oysters expertly produced at Drake’s from Washington or Louisiana would dump tons of CO2 into the atmosphere. Local is more than a buzzword in the Point Reyes community and about the furthest away you can find the shellfish is in San Francisco. In the law creating the Seashore, the California Department of Fish and Game explicitly reserved the right to license fishing and aquaculture operations in the seashore boundaries. Not the NPS. This kind of jurisdictional overreach is a big part of the dispute over Drake’s permit extension. The pods are here! Lets weaponize National Park Service administration! OMG right there in our park! Alien pod-pickers? – and in delicious irony for the metaphor, the pods have an uncanny resemblance to our beloved oysters! But sound files from a New jersey Police study of JetSki noise was inserted into a sandbagged report that falsified the racket as being generated by the skiffs the Oyster harvesters use. Busted. There is nowhere on this planet which is unaffected by the human race and its doings. To even think that Point Reyes can somehow be utterly “cleansed” or “purified” by some kind of exorcism of the last 150 years of fishing and ranching. let alone human existence, is ludicrous. The law creating the Point ReyesNational Seashore foresaw this. It is clear. It is realistic. It must not be twisted to the irrational zealotry of a few who want to bankrupt good governance, robust and healthy science, and sanity. This entry was posted in Creepy Security Stuff, Petroleum Planet, WTF? and Humor and tagged “sloppy use of data, Bracero Program, Bush, but forgive the troops”, California, disqualify, Dr. Goodman, Dr. John Harwood, Dr. Paul Thompson, Drake's Bay Oyster, Drakes Estero, false report, Harbor Seals, iran, iraq, John Muir, McCarthyism, NAS/Ocean Studies Board, NAS/OSB, National Academy of Sciences, National Park Service, New Jersey State Police, NPS, NPS Director Jarvis, nuclear, obama, Point Reyes, Point Reyes National Seashore, Reyes, security, Sierra Club, Sir Francis Drake, Sound, Stuxnet, United States, Washington DC, yelp. Bookmark the permalink.